Home / Dance / Why Dance? People start dance for all sorts of reasons. 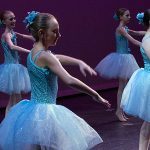 Parents enroll their child in dance, adults might want a fun way to stay in shape, and ‘tweens’ and teens might join for the social aspect – because their friends take dance. More and more guys are getting involved, too, since Hip Hop and Breaking have made it less intimidating. In fact, many people are shocked when they learn how many football players and other athletes, have taken dance; whether it was required at college or they realized the benefits as part of their workout. But are there good reasons to make dance a lifelong activity? It’s physically active, social, and gently challenging. It is also the only activity that engages most of the senses; hearing, seeing, touch, voice, and sometimes even taste and smell. 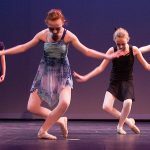 Current research is showing what dancers have known for years — dance improves your mind-body connection, and helps you stay healthy and vibrant at all ages. No wonder movement education is showing up in more and more school districts, senior communities, and day care centers. Memory centers and senior communities are now including movement coupled with music (also known as dance) in daily regimens and to enhance residents’ experiences and overall health and well being. So what’s stopping you — you’re never too young or too old, too thin or too fit, to include dance in your daily or weekly regimen. It will do your Body, and your Brain, good. In fact, “Brain” Dance is being used more and more for babies through seniors.